Survey Sites: Most are NOT WORTH YOUR TIME! 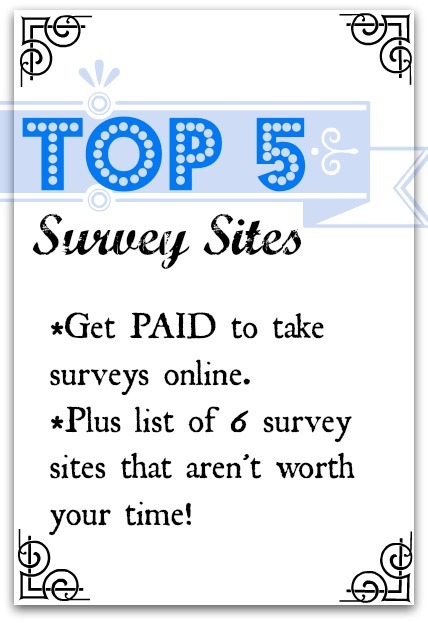 There are tons of survey companies out there where you can get paid for taking online surveys; and some are better then others. I would love if readers could chime in and let everyone know which is their favorite! Personally, my favorite is Pinecone Research as the surveys pay $3 per each one and you get paid every time. And they don’t send you surveys you don’t qualify for! Currently, they are not taking applications – but as soon as they are again, I will let you know! They are finally taking applications again! 2nd Favorite: Another reputable one is Opinion Place: You are told up front how long the survey will take and what you will be paid. UPDATE: My Survey.com people have commented here and on Facebook that it is a great one too- and they are taking applications now! And Synovate I also recommend, which isn’t taking applications now either but I will let you know when they do again. Opinion Outpost – this was not originally on my list, but people are loving it! I have been a member for 8 months now and love it. I get new products randomly-like pasta sauce, shampoo, paper towels. I also have take a two-week survey study where I got $25 at the end. I love it! I joined them last time. I love their site, and they have EXCELLENT customer service. I was sent a survey for my 15 year old daughter to do, but when she clicked on it it said “Thanks for participating!” LOL I emailed Marie and she credited my account anyhow~! That’s it. I haven’t found anything else worth the time…. Dollar Surveys: I wouldn’t recommend this one because you have to take surveys to see if you qualify for surveys, and it can waste your time. Surveyhead: I wouldn’t recommend this one because it has bad reviews online; again you have to take surveys to see if you qualify for surveys. And you have to reach certain payment thresholds, supposedly once you get close to cashing out, then no more surveys are available for you. Toluna: This one also has horrible reviews and it takes several surveys to even make $1. My least favorite is Inbox Dollars as they send you tons of annoying emails and you get like $.05 per click. Survey.com: I haven’t tried this one. Please leave a comment and let me know if you’ve tried it out! Ask CCD Readers: Please chime in if you have experience with these or any other survey sites!